After telling everyone “no gifts please” and dropping hints about experiences, consumables or cash, I ended up getting the most fabulous array of gifts for my 50th from various people including some brilliant photographic books, candles, perfume, jewelry and champagne. I take it all back, don’t listen to anything I say, gifts are great!One particular award for “outstanding achievement in over the top birthday gifts” must go to a very dear friend who agonised over what to give me and then was typically over-generous when she had delivered the biggest and probably the most expensive book I will ever own. It’s the Culture Chanel book – a photo essay that was created for an exhibition of the same name about our friend Coco who was close to the greatest artists of her time including some of my favorites Pablo Picasso and Salvador Dalí. 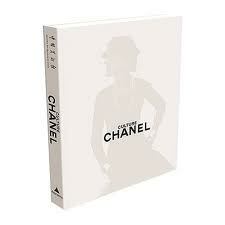 This book has it all FASHION, BRANDS, ART, PHOTOGRAPHY, FRANCE…need I say more? 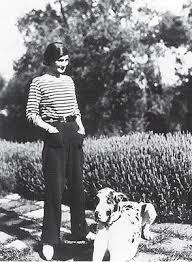 Anyway, I was reminded in one of my all time favourite pics of Chanel that she pioneered the wearing of pants for women. And boy, did she thrash her black pair. Which makes me feel better that I have worn the same pair three days out of five this week, an old Max pair from the 2009 Truly Madly Deeply collection- yes still, they have lasted. (they are nice and baggy so every year I just shift the button a couple of millimeters out….). I am going to see if this pair actually lasts me the whole of winter. I’ll try and find a good pic to post of them but in the meantime here is a lovely woman I found on Pinterest who has the right idea…. Thanks friends for all my beautiful gifts and thanks Coco, for giving us the gift of black pants.